Byron Bay, Australia's Worst Kept Best Secret - WattWhereHow? For many years, Byron Bay was Australia’s best kept secret. Now it’s out, are you in? During the 1970s through to the 90s, the Bay was a haven for hippies. What’s not to like? It’s a beautiful beach side community where dolphins frolic and surf the early morning waves alongside local surfers. It has a peaceful vibe that can still be felt despite the crowds and it has an amazing creative spirit seen in the communal art spaces and venues that have outlived the gradual expansion of Sydney retail and blow-ins. 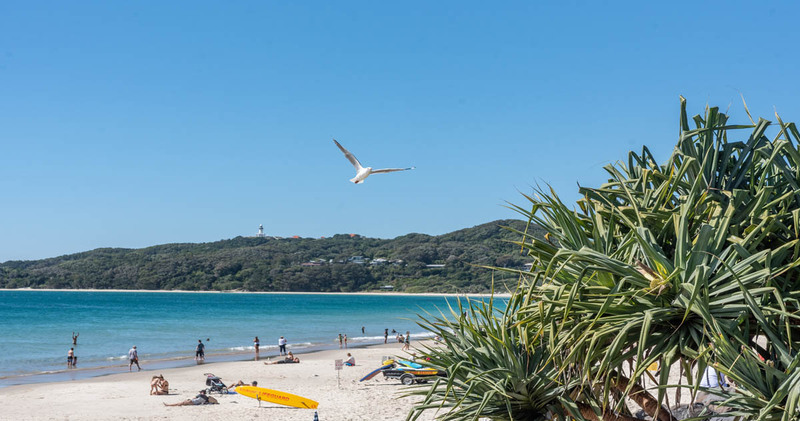 Yes, Byron Bay is magical in a way that Indian dream catchers and shops full of crystals can’t capture and it’s that magic that brings in hundreds of thousands every year – a sad factor that has the potential to destroy what makes the place so appealing. For all the vegan restaurants that are still here, there’s a disturbing number of retail chains and backpacker tour sales outlets. But if you look beyond that and just enjoy it as a first timer you’ll want to come back again and again. Catch some waves or rays. 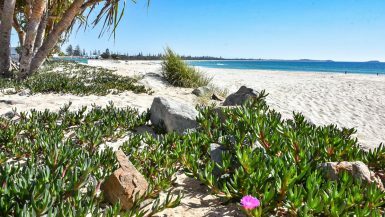 The main beach is relatively protected making ideal for first timers and body surfers. Watched over by volunteer life savers and the distant lighthouse, the waters are clear and inviting and warm enough to swim in most months. Beyond the breakers there is a coral encrusted reef that is great for snorkeling but only attempt it with a group. Paul Hogan (Crocodile Dundee), Laura Dern, Ben Harper, Crowded House, Russel Crowe and at least one of the Hemsworth brothers have property here so hey, you never know your luck. Just across from the beach under the shade of giant Norfolk Island Pines, you’ll find Byron Bay’s best beer garden at the Beach Hotel. The indoor-outdoor space incorporates a grill, three bars, picnic table seating and a stage for live performances. Look out from your breezy seat and take in one of the world’s best bar views. 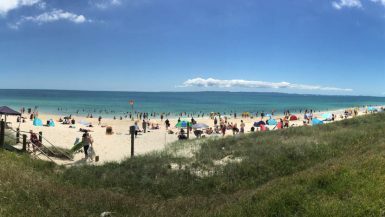 The Great Northern Hotel harks back to the golden age of family beach vacations from Sydney, where the hotel was also the main entertainment venue. Since the 1990s, the band room at the Great Northern has hosted Australia’s best acts and major international touring artists performing intimate gigs after appearing at Byron Bay’s famed Bluesfest or Splendor in the Grass festivals. If the band room is closed, the front bar delivers icy cold beers and a great vantage point for people watching. The hotel still has budget accommodation upstairs too – just like it did in the 1937 – though this is just the rebuilt hotel. The original dates back to the late 1800s. Cross the road and you’ll find the bakery, a fixture since the 1980s. For eons, it was the only place to buy anything to eat after midnight and it still does a roaring trade on meat pies and plant-based pastries to ward off the late hour munchies. The Railway Friendly Hotel is another venue that retains the “old Byron” vibe. 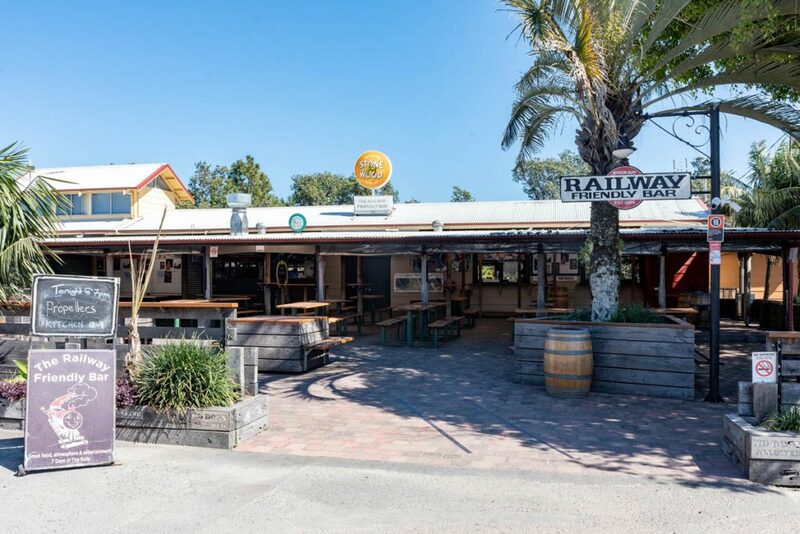 Built on the platform, where it would have once been the restaurant and kiosk, the narrow bar area is usually packed with hippies and backpackers. 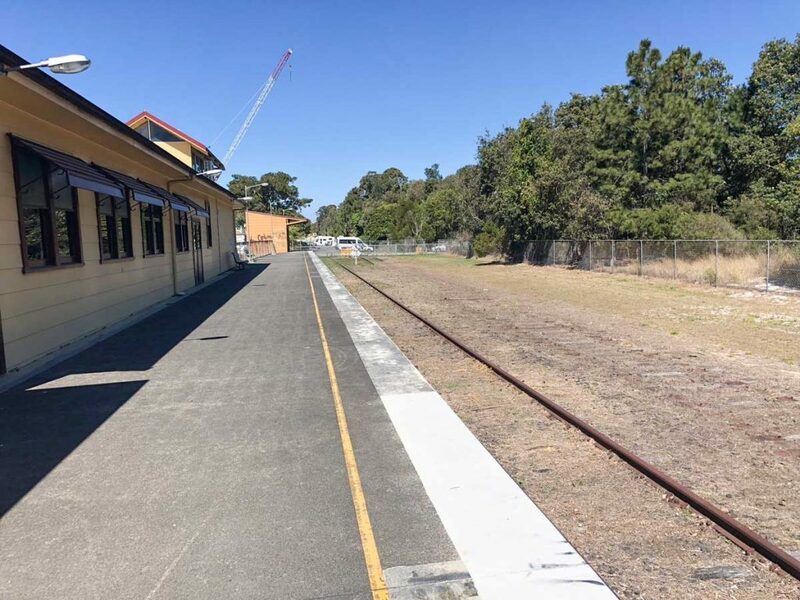 If you’re there at the right time of day, you’ll actually see the Sydney express arrive and disgorge its weary passengers – many who will soon be sitting next to you sharing a beer. On most nights you’ll be able to catch earthy funk, reggae, folk and indie bands out the front in what is an unofficial beer garden. Another relic of Byron Bay’s past is its itinerant hippies who sleep in tents or swags beneath the trees in the adjoining park. 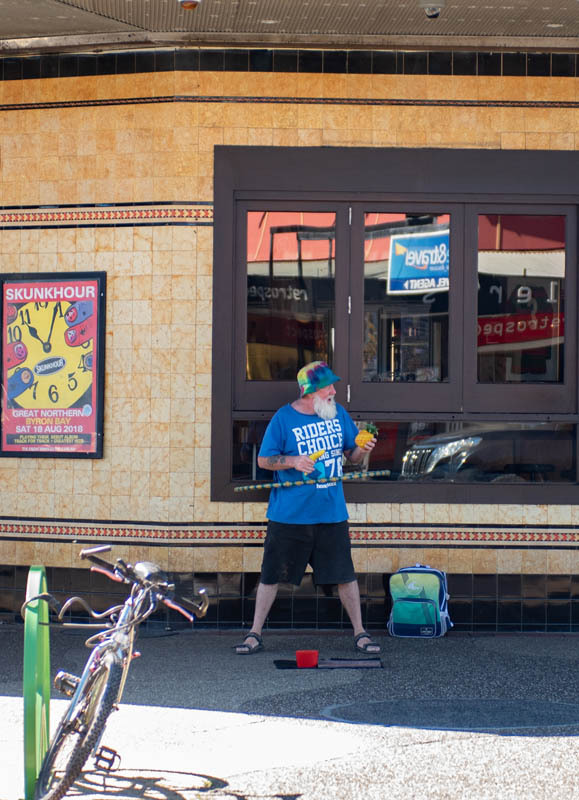 To find the communal hippy types you have to head out of town to enclaves like Mullumbimby or the notorious Nimbin, which is a counter culture town with more than its fair share of drug related issues contrary to its rural idyll. The park outside the Railway Hotel is full of hippy vagrants. The Main Street of Byron Bay is the retail center and is worthy of a lazy post-beach browse. 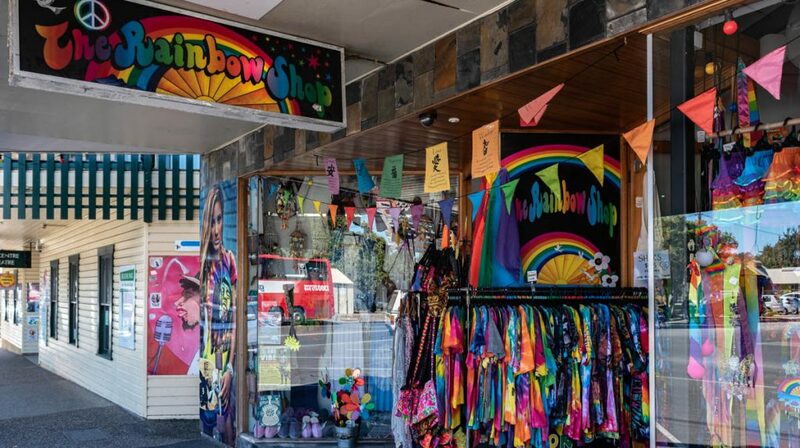 Many of the character shops of old have been replaced with major Australian chain stores but there are still some interesting boutiques for beach fashion, record stores and whole food markets. Expect to see plenty of rainbows, incense and crystals alongside smoking implements. 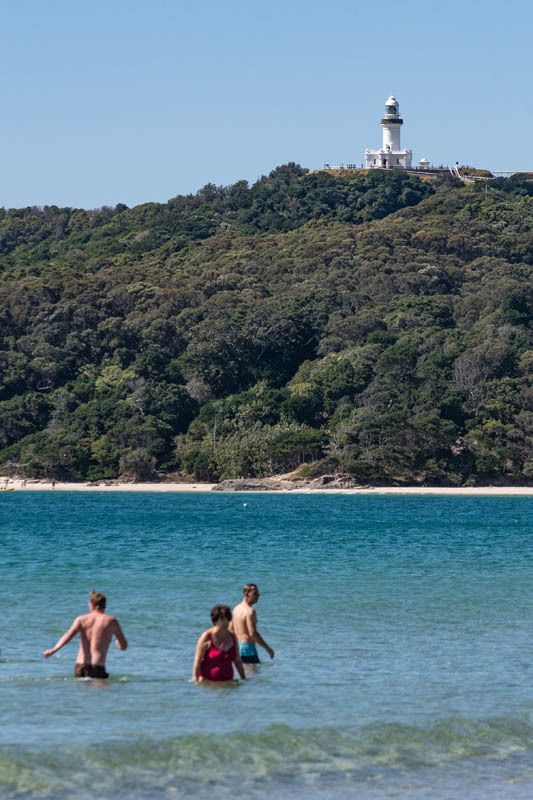 Perched on the cape overlooking the bay to its left and the amazing surf beaches of Broken Head to its right, the Byron Bay lighthouse has protected ships from making unwanted connections with Australia’s eastern-most point. Until recently, a herd of wild goats used to feed on its grassy cliffs. While there is paid parking at the Lighthouse, you may have better luck parking at the small car park halfway up the hill as it’s usually almost impossible to score a park. One of the original venues for music, art and youth, the Arts Factory was the breeding ground for international emo-screamo band, Parkway Drive. It’s where you could be watching The Pogues’ Shane Macgowan one night and members of the Beastie Boys the next. The venue still exists but has been heavily gentrified. Now it shares its space with a small arthouse cinema (which has been there since the dawn of time) and the Byron Bay Brewery, which has grown from a few large fermentation kegs to a full brewery with much of its product made at Queensland’s XXXX brewery. It’s pristine, white and nothing like the sweaty, dark tin shed we remember. 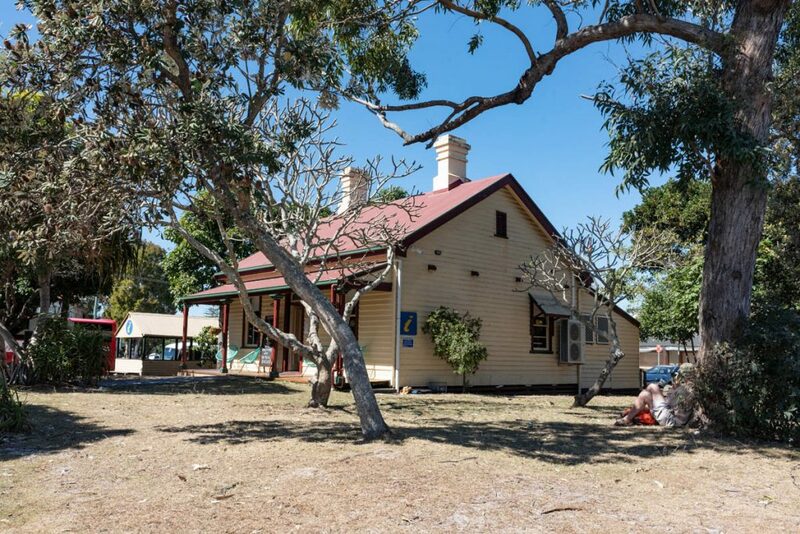 Out the back is a comfy wooden deck full of cushions and built around the thick roots of a Moreton Bay Fig tree. Not a bad place to catch up on life with close friends. 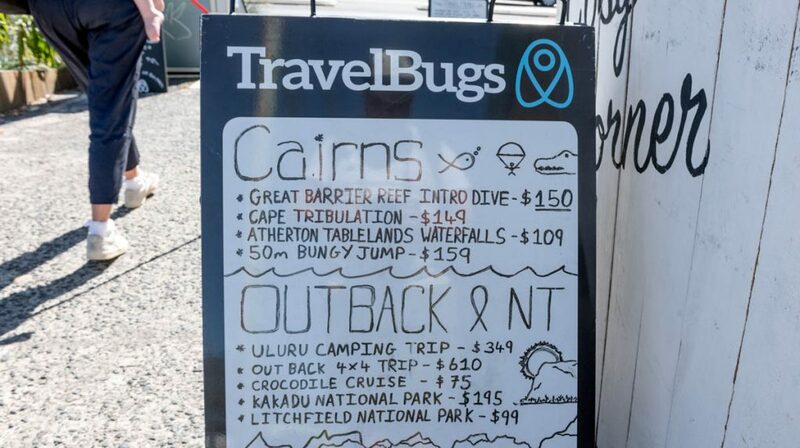 If you want the full backpacker experience, the Arts Factory Backpackers is well serviced with small dorm rooms, juice bar, pool and close proximity to the Arts Factory and Byron Bay Brewery. As an added curio, it was featured in the British movie, The Inbetweeners 2. If budget permits, there are plenty of luxurious resorts and motels to choose from as well as camping grounds if you really want to rough it. Byron Bay is a much-loved beachside town on the northern New South Wales coastline in Australia. 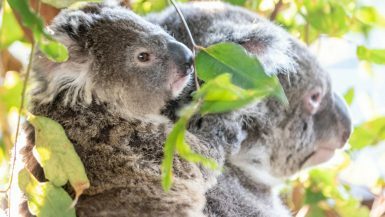 Its hippy vibe, year round temperatures and popularity with backpackers makes it a must-visit stop on the road trip between Brisbane and Sydney. Byron Bay is situated at the easternmost point of Australia between Kingscliff and Ballina. Byron Bay is about an hour and a half drive from Brisbane, 45 minutes from the Gold Coast and about 10 hours from Sydney. Most backpacker buses service the town.